Computer processors for PC like devices fall into four broad categories, starting with the smartphone/tablet, then the notebook, the desktop and finally the extreme desktop/server. These segments have different cadence formats from each of the companies that compete between new designs. For longer cadences it makes sense to launch an improved product in the middle of that cadence taking advantage of minor production improvements. 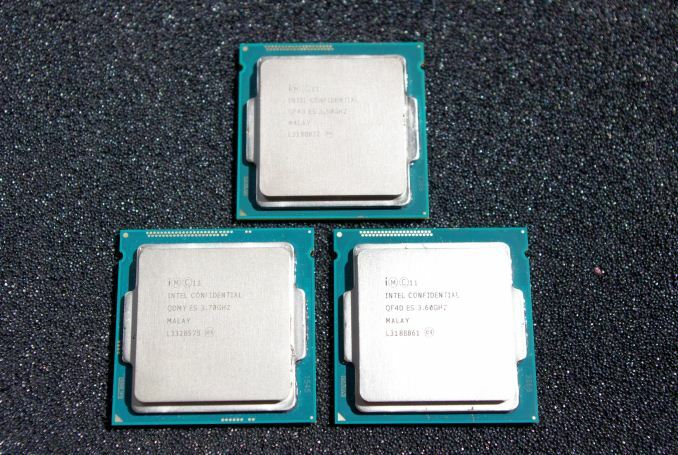 To that end, Intel is updating their June 2013 Haswell CPU line with a ‘Haswell Refresh’ – 20+ CPUs aimed to be faster at similar price points to the original Haswell release. Mainstream media are all too ready to pounce on the end of the desktop. While it is true that casual computing is shifting towards smaller hand-held devices, in most ‘work’ type scenarios that involve more delicate interaction than just touch, the desktop is still king. The rise of smaller PC-like devices such as the Mac Mini, NUC and the BRIX now separate the desktop into two categories: human-limited content production against computer-limited content processing. For human-limited content production, the smaller PC-like devices are ideal. Typically limited to faster dual core or slower quad core parts, a single storage drive and integrated graphics, these devices make their use in writing reports, writing reviews, browsing the internet, answering emails and minor photograph/video editing. The ultimate goal is that no matter how long you might be waiting for an email to send, or a photograph effect to be processed, the limiting factor is the technology between the keyboard and the monitor: the user. For home use and most workplace scenarios, the smaller PC-like device makes sense. They end up using a mobile CPU variant that is binned for low power and voltage, and can make use of cloud storage for anything more substantial. For other users, where the goal is better graphics, enhanced detail, pure processing, a testing environment, a DRAM limited scenario or the need for grunt is paramount, then a full-desktop should be the answer. The two main players are Intel and AMD. AMD focuses on specific workloads geared at integer type commands and are gambling on the heavy integration of the GPU for these type of workloads via OpenCL. Intel is king in general purpose single-threaded performance, wherein most software requires brute force down a single code path because that is the easiest way to write programs. Intel multiplies this out into many cores and many threads in order to allow more of these processes to run at once. This can be considered not the most power efficient way of designing a processor (more cores and more MHz can push efficiency out the window). Both of these companies have a processor cadence. AMD recently released their Kaveri platform in January, following their Richland platform back in June 2013. Kabini was a half-node change on a different silicon platform (32nm SOI to 28nm SHP). 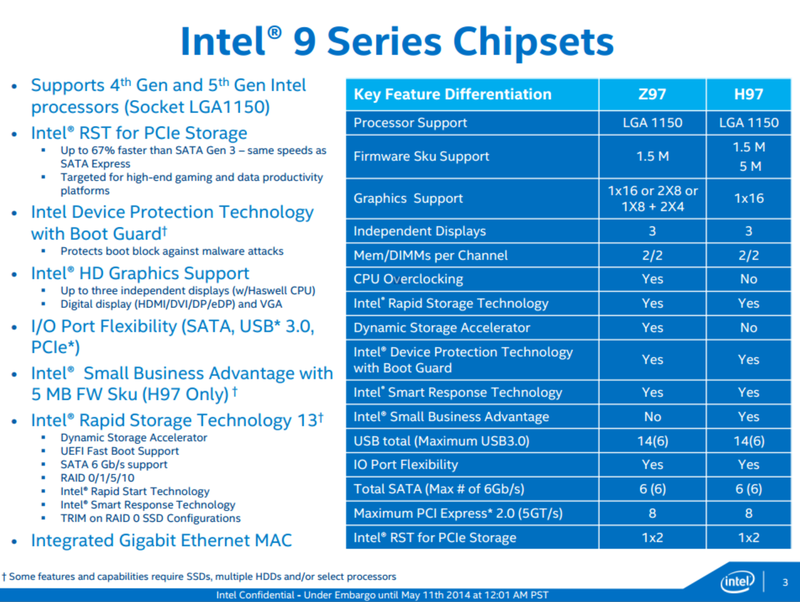 On the Intel equation, ignoring the Atom and Extreme processor lines, the last full release was Haswell in June 2013. Before this was Ivy Bridge in April 2012. As part of Intel’s tick-tock strategy (a tick being a die shrink, a tock being an architecture update), Ivy Bridge was a tick from Sandy Bridge, and Haswell was a tock from Ivy Bridge. The next platform is Broadwell, a tick/die-shrink from 22nm to 14nm due out (by our estimates) somewhere near the end of the year. That makes Haswell to Broadwell a full 15 to 18-month gap with nothing in-between for the desktop space. Having such a large gap between launches can make other companies, particularly the partners that depend on these releases, somewhat frustrated. A new product means an opportunity to promote new hardware and new designs, bringing in the profits. In an industry where sales revolve around new releases, there has to be some form of relevant cadence in order to tell shareholders when jumps in revenue are expected. In order to satiate both sides of the equation, Intel is today officially releasing two series of products. The first is the new 9-series chipsets for current Haswell CPUs and upcoming Broadwell processors. We will be looking at the performance of the chipset in more detail when it comes to motherboard reviews later this week. The second side of the launch is the Haswell Refresh processors – a set of 20+ CPUs at higher frequencies/better price points than the original Haswell release. Today Intel is launching two mainstream 9-series chipsets, both evolutions from the 8-series platform. Z97 and H97 motherboards based on the new silicon also go on sale today, supporting the LGA1150 socket only. The primary purpose of these chipsets over the 8-series is to introduce more storage options, including SATA Express and M.2. As with the previous nomenclature, Z97 is the overclocking platform aimed at multiple GPUs and maximum everything whereas H97 is a cheaper option with Intel’s Small Business Advantage add-on with certain firmware versions. Rapid Storage Technology is now enabled for PCIe devices, allowing (we believe) integration of the SATA Express and M.2 devices into RAID arrays or SRT hybrids. Both of these chipsets will support current LGA1150 processors (Haswell) and future ones (Broadwell), and maintain Flex IO with up to six USB 3.0 and six SATA 6 Gbps (the same as 8-series). I mention the processor support based on the fact that Intel has not confirmed if Broadwell processors will work on the older 8-series chipsets. In fact when Intel announced the Haswell based Devil’s Canyon SKU back in March, we were told by Intel that this SKU is “supported on Intel® 9 series chipset. Intel® 8 series boards are not targeted for “Devil’s Canyon” support.”, which might mark Broadwell in the same vein. With 9-series, Intel is enabling Rapid Storage Technology 13, allowing UEFI support, RAID 0/1/5/10 on chipset ports and TRIM in RAID 0 SSD configurations. With M.2 and SATA Express, the RST will solely be for a PCIe x2 slot, which means implementations like ASRock’s M.2 PCIe x4 on their Z97 Extreme6 might be excluded (the x4 is also routed via the CPU, not the chipset, which may be the reason). The chipset has access to 18 ports, four of which are USB 3.0, four are SATA 6 Gbps and 6 are PCIe. This leaves two sets of two, the first set can be configured for either USB 3.0 or PCIe, and the second set are either SATA or PCIe, but only a maximum of eight PCIe ports are possible. 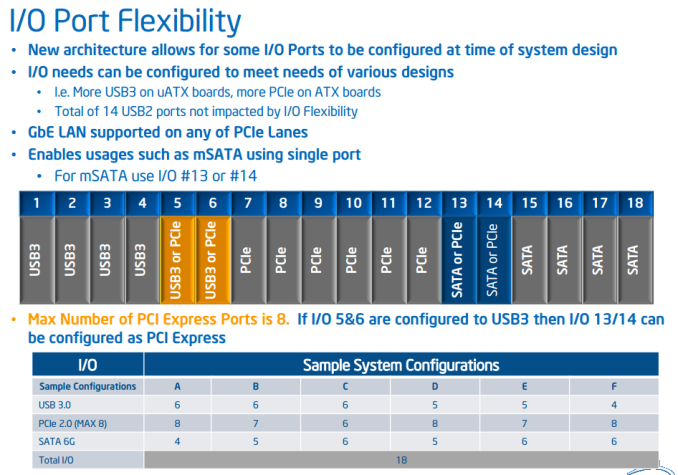 This is designed as a catch-all interface for different sized motherboards, where some can use more PCIe lanes, others can use more USB 3 ports, and so on. Eventually as the future of the chipset progresses, I see all these ports becoming flexible, though I would imagine we are a few years out from this. Thus the SATA ports with SATA Express will also be hooked up to the chipset ports for a mixed IO solution. With the motherboard shown above, an amicable solution is found: the two ports on the right are plain chipset SATA 6 Gbps ports. The combined mass in the middle is four SATA ports, two of which can be used instead for SATA Express duties or plain SATA, but not both. This means if SATA Express is used, two SATA ports are lost as well. Finally on the left is another set of two SATA 6 Gbps ports, this time from a controller. We will find that some motherboard manufacturers completely separate the SATA Express ports from the chipset, using a switch to change between a controller and SATA Express functionality instead. A motherboard manufacturer can also use a SATA Express controller, which uses two PCIe lanes and an internal switch/SATA controller to provide either SATA Express functionality or SATA ports. M.2 (NGFF) is another part to this due to the mixed standard it operates. M.2 can be either SATA based or PCIe based, and the slots can be wired up differently. Technically the specification allows for four PCIe lanes and one SATA 6 Gbps port through the connector, although we might see motherboard manufacturers solely use a PCIe x2 connection as a result and SATA-based M.2 will not function. One might think that while M.2 was designed to unify the SFF storage standard for PCIe, it just happens to make things more complicated when motherboard manufacturers do not want to lose functionality. With RST13 / 9-series, Intel is now supporting Rapid Start Technology with 16 GB of storage. 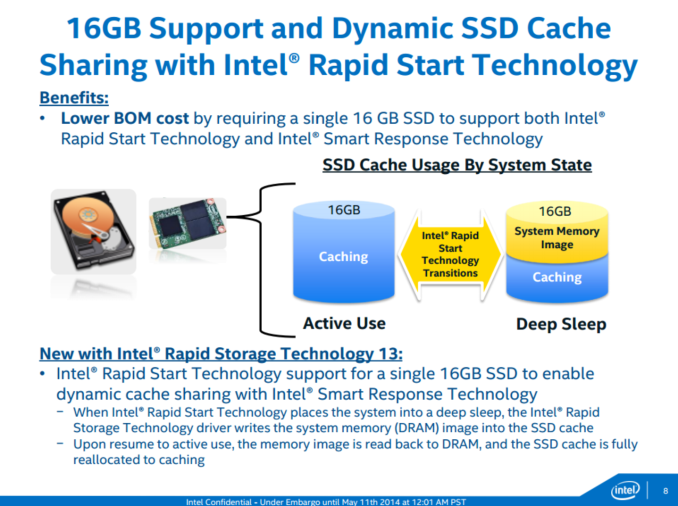 This would allow systems to enter a deep sleep, write the contents of DRAM to the SSD cache, and then resume to active use by doing the reverse copy. 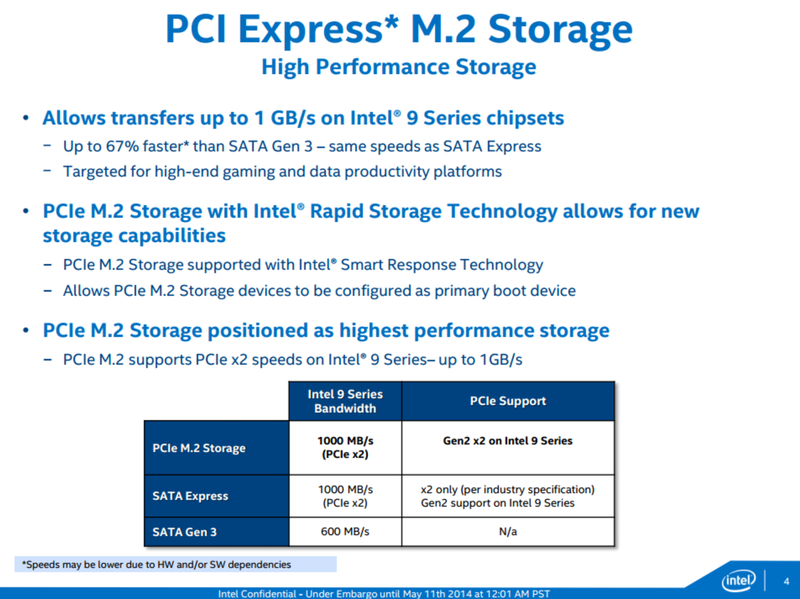 While Intel is promoting the lower BOM cost to entry for this platform, I see it a little differently. It would allow portable devices to have suitable storage soldered onto the motherboard (consuming a SATA port) and the system by default, even with an SSD, uses RST. Chances are that the 9-series chipsets also include efficiency enhancements under the hood, but Intel only provides information regarding their consumer-facing adjustments. In that respect, the 9-series is only a relatively small bump in storage options. Everything else remains the same, or to put it another way, due to the storage options designing a motherboard gets a little harder. All the major motherboard manufacturers will have 9-series based products up for purchase today, ranging from $120 to $400. We covered the leaked images from GIGABYTE, ASUS, MSI and ASRock in a short article a couple of weeks ago – some of the galleries are below. Stay tuned for full reviews of some of these motherboards in the next couple of weeks. This "Haswell Refresh" is total nonsense. It is just shuffling a bit with names and frequencies. "AMD's CPUs can't even compete with the i3"
I think you've read some other article, because A8-7600 destroys the equally priced i3 in most tests.